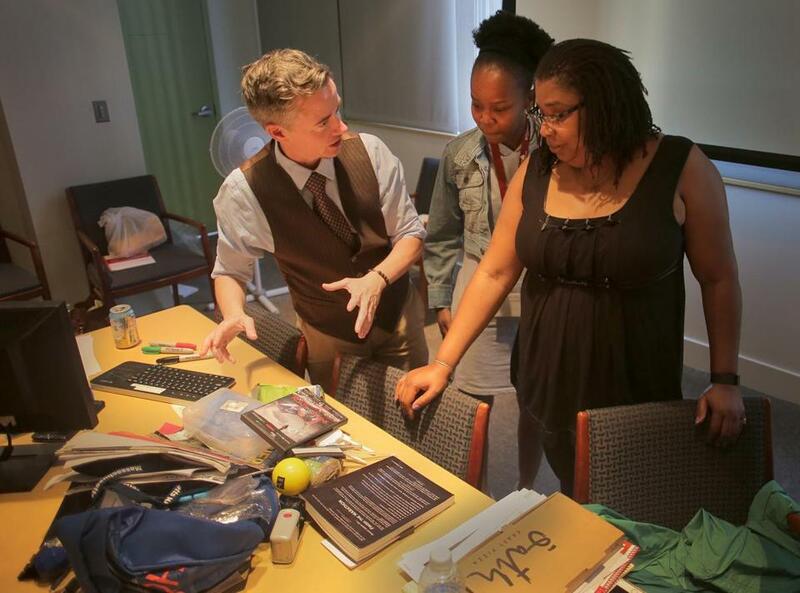 Jesse Edsell-Vetter (left) explains a role playing exercise to Leneva Penton (right) of Urban Edge and Chanelia Dorest of the Metropolitan Boston Housing Partnership. Awoman was shocked to learn she’d accumulated over 3,000 tank tops. A man filled his house with nearly 15,000 books. To him, they’d become tangible reminders of his intelligence. A musician collected nearly 20,000 records. The hunt for a new ones brought him a joy like nothing else. So he clung to his vinyl for dear life. At a three-day Hoarding Intervention Training Institute recently hosted by the Metropolitan Boston Housing Partnership, human service professionals from around the state and country looked at cases such as these to understand the factors that contribute to hoarding. The certification program is being touted as the first of its kind. It’s based on an innovative model developed with the Boston University School of Social Work that’s less about cleanup and more about coaching. This model has had an over 90 percent success rate, according to officials with the Metropolitan Boston Housing Partnership. Since 2006, it’s helped hundreds avoid eviction due to hoarding. Hoarding, or the acquisition of and failure to discard a large number of possessions, is a multilayered mental illness that affects 5 percent of the US adult population, approximately 15 million people. It can result in unsafe living situations. On June 17, two Westfield women died in a house fire. Their building didn’t have smoke detectors and officials said a “hoarding situation” made it difficult for firefighters to enter the house, run hoses through the building, and extinguish the fire. Though the reasons for hoarding disorder vary, there are a few common characteristics, including a difficulty making executive decisions, perfectionism, and low self-esteem. Someone with a hoarding disorder might have difficulty regulating emotions and a real distrust of others. Even the most well-intentioned loved ones may make the mistake of removing items assuming the person wouldn’t notice. But, Edsell-Vetter said, the person probably did notice and will be less inclined to allow that loved one back in the home or ask for help in addressing the situation. Building trust and rapport is crucial. Participants in the training were encouraged to adjust their language. Rather than saying “this place is a mess,” they inform clients of the hazards of not having an exit. Rather than judging, they learned to use empathy to give feedback. The Mental Health Association in Atlantic County, N.J., has used this hoarding intervention method for several years. It was adopted in the years after Hurricane Sandy devastated the region in 2012. There were residents with hoarding disorder who were not recovering from the storm. These people would not let anyone do repairs, said Jaime Angelini, director of consumer services at the Mental Health Association, who attended the training here with a colleague. After the storm waters subsided, mold grew on wet piles of their possessions, and clients were unable or unwilling to let waterlogged items go. She told them about her things and how they brought her joy. Her teapot collection, for example, was a reminder of her late son. Laura Minier, manager of social services in Scituate, plans to bring what she learned back to her community. One local woman’s story motivates her. The client had been diagnosed with cancer. Minier’s team helped the woman clear out enough space to be able to die peacefully at home.